A high-quality lard, spiced and put to mature in marble tanks rubbed with garlic, an excellent product which wins consumers’ taste, starting from sight and smell. 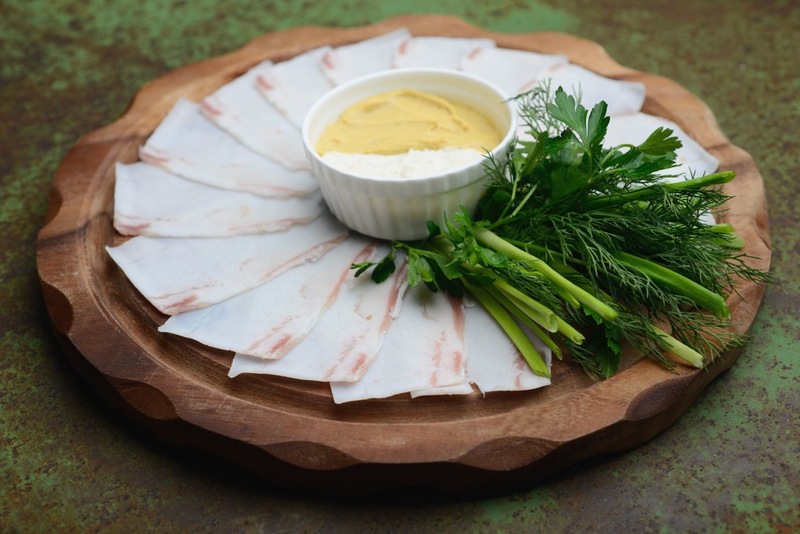 Colonnata lard has a fresh flavour, salt and at the same time sweet, its look is white and attractive, soft but compact, with rose veins which remind naturalness of this product. However, this simplicity is also a synonym of technical and artisan accuracy, which comes from the use of both knowledge and materials of its land. 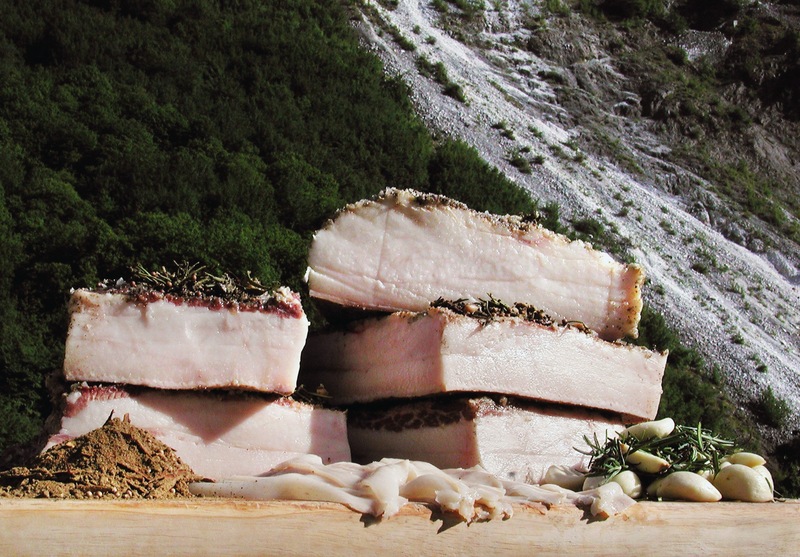 A century-old history brought Colonnata lard on Italian tables as well as all over the world. Today this product has been rediscovered by the most renowned chefs thanks to its incomparable flavour and scent as well as lightness of this animal fat for preparing luxury recipes. The raw material is the fat which is situated under the skin of the pig. The obligatory ingredients for working and seasoning this product are natural sea salt, black ground pepper, very fresh rosemary, garlic into large pieces. Garlic is also used for rubbing the tanks before working and seasoning. This is a rigorous and controlled procedure, which is accompanied by the free choice of every company of using, in addition, other vegetables, which however must absolutely come from the surrounding land. So, every company has its variety, as for scent, because they can also use cinnamon, star anise, coriander, nutmeg, and cloves. Anyway, the result always consists in an inviting product, easily sliceable, tasty, natural, and tempting. 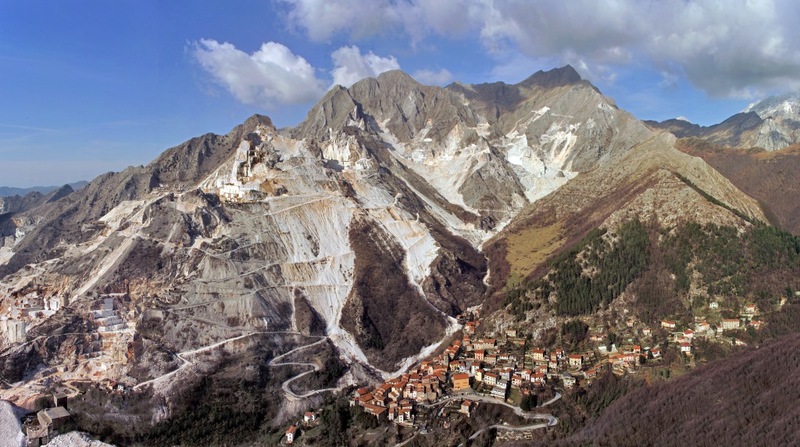 The marble tanks which act as a natural fridge are produced in the white quarries that are in the land of Apuane Alps. This is a corner of Tuscany which grazes the mountains of Liguria and Emilia Romagna. Every day of the year, this landscape is whitened by the presence of these big open quarries, where the sparkling marble that goes all over the world allows these places being a coveted photographical set. In this landscape, which reminds both tale and industry, there is Colonnata, an evocative village facing sea, but protected by the mountains of Tuscany. This allows a climatic mix which, alongside with quality of marble, cooperates to the success of Colonnata lard. We are talking about a few dozen local companies, a production of 1.600 quintals, more than 300 of which go to export in France, Germany, England and Russia. A product which is often imitated, but never manages in reaching the quality guaranteed by the original trademark, a green rhomb with a big pig and stylized Apuane Alps. This trademark is managed by a rigorous producers’ Consortium, which controls that no lyophilized substances, neither natural nor artificial aromas, preservatives, additives are used. The seasoning, which lasts from 6 to 10 months, natural humidity of the caves, and porosity of the walls in marble of the tanks guarantee the natural conditions for ripening. The bacteriological analyses proved that the ‘ancient’ method is very efficient and does not require either chemical treatments or artificial preservatives. IGP Colonnata Lard is white, almost rose, with its upper part coated with sea salt, whose colour is grey-black because of the spices it is soaked with. The thickness of the pieces ranges from 4 to 6 cm as tradition requires. These are the rules which oblige packaging to conform itself to present this product in an imaginative way. It is proposed in both practical vacuum-sealed packaging from 400 g to 1 kg and in the nice basins in marble of different sizes, whose width ranges from 12 to 50 cm. Taste it… on pizza, too! 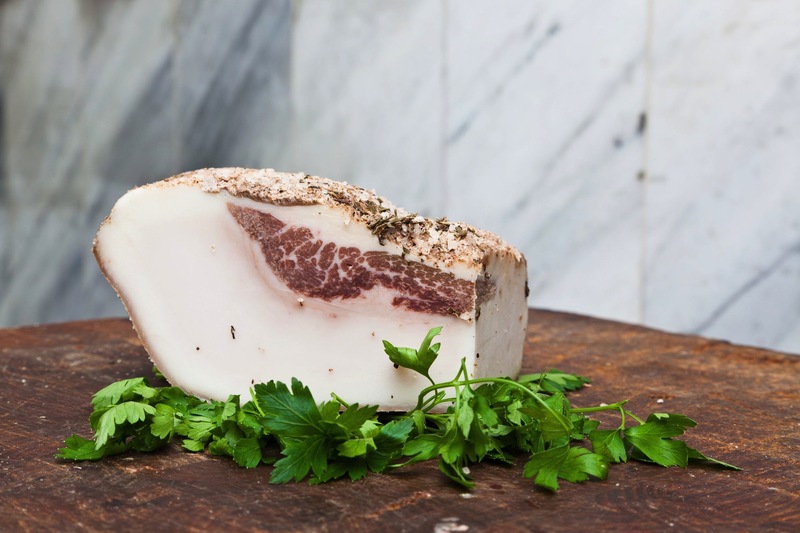 Colonnata Lard, which is tasty when used raw, keeps its aroma in a light cooking, too, giving a marked scent without burdening the final result. Its natural destination consists in consuming it in thin slices on Tuscan bread, but since a little time its use has been appreciated on pizza instead of extra-virgin olive oil. When pizza is cooked, either with tomato or without it, thin slices of Colonnata Lard are placed on its warm, freshly baked surface and it must be served immediately. The result is a wonderful flavour and a great scenic effect. It is excellent on fresh vegetable-based pizzas.